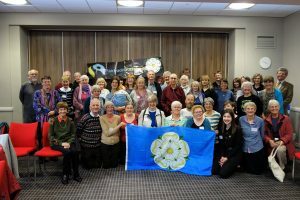 The Yorkshire Fairtrade Supporter Conference provided a boost for Fairtrade campaigning in the region. 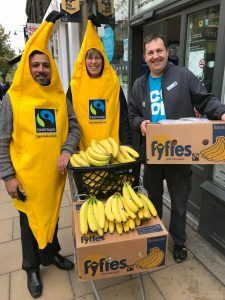 Held at the University of Leeds on 22nd September, attendees were able to learn of the huge amount of activity that was taking place to promote Fairtrade across Yorkshire. Speakers included: rice farmers from Malawi, Webster Kita and Howard Msukwa; Linda McAvan MEP; Professor Bob Doherty, trustee of the Fairtrade Foundation; Fairtrade Yorkshire Coordinator, Mark Dawson; and Head of Campaigns at the Fairtrade Foundation, Kevin McCullough. 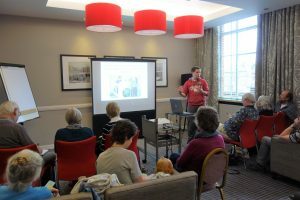 Workshops were held on: the latest developments in Fairtrade, working with social media, ideas for introducing Fairtrade to young people and Fairtrade in places of worship. Mark Dawson was elected as the new National Campaigner Committee member representing Yorkshire. He paid tribute to the work of his predecessor, Karen Palframan. With the addition this year of Fairtrade Embsay with Eastby, there are now 38 Fairtrade places across Yorkshire. 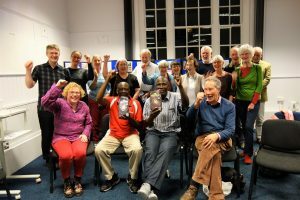 In recent years new active Fairtrade groups have been established in Morley, a faiths group in Hull, a renewed group in Sheffield and, two years ago, Halifax achieved Fairtrade Town status. The Yorkshire tour of Malawian rice farmers, Webster Kita and Howard Msukwa, was a great success. Webster and Howard visited Ilkley, Leeds, Sheffield, Skipton and York and spoke of the issues affecting farmers in Malawi. 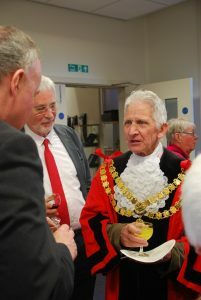 In Skipton they were given a civic reception from Town Mayor, Alan Hickman. Webster and Howard addressed hundreds of people across their tour and told of the difference their trading partnership with Just Trading Scotland (JTS) has made to the lives of farmers and their families. Webster and Howard produce the renowned Kilombero rice, regarded as one of the finest available for purchase in the UK. See the JTS online shop. JTS has challenged schools, as well as churches, colleges and other organisations, to sell 90kg of rice – the amount of rice sold that would enable a Malawian farmer to pay for a year’s basic secondary education for one child. 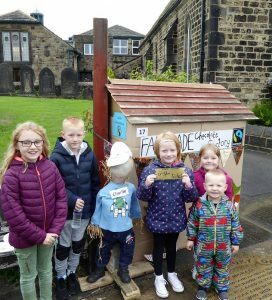 On Saturday 8th September, hundreds of visitors walked round the centre of Baildon, on a drizzly wet day, looking at scarecrows on a theme of Literary Characters. Most children recognised Charlie who stood by a Fairtrade Chocolate Factory, replete with tall mill chimney. They, and their families, were offered Divine Fairtrade Chocolate samples, which were very well received. 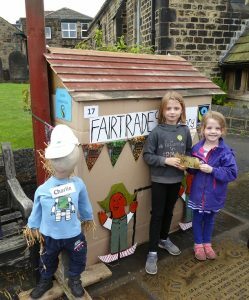 In all, 520 chocolates were handed out, mainly to the children, suggesting a figure of around 800 visitors who interacted with members of Baildon Fairtrade Group who braved the weather to introduce Charlie. 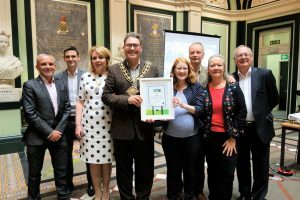 On 7th September a celebration was held at Halifax Town Hall to mark the renewal of Halifax’s Fairtrade Town status. Halifax has now been a Fairtrade Town for two years. 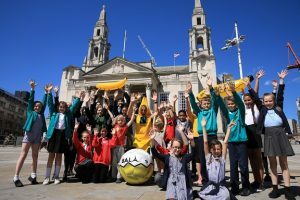 During that time Fairtrade activity has expanded to include many different sectors of life in the town including: the Piece Hall, Halifax Minster, many local schools, community groups and employers. Halifax MP, Holly Lynch spoke at the event, as did the Coordinator of Fairtrade Yorkshire, Mark Dawson. 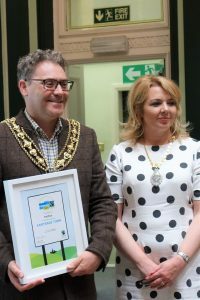 Mark thanked Holly and Adam Wilkinson for the work that they had put in to ensure that Halifax Fairtrade Town was such a success. Other attendees included: the Mayor and Mayoress of Halifax and the Leader and the CEO of Calderdale Council. 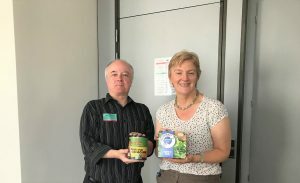 In June Mark Dawson, Coordinator of Fairtrade Yorkshire, visited the European Parliament in Brussels to learn of the work of the European Parliament Fairtrade Group. The group has successfully raised awareness of Fairtrade amongst MEP’s and other areas of the governance of the European Union. Coordinator of Fairtrade Yorkshire, Mark Dawson and Linda McAvan MEP. 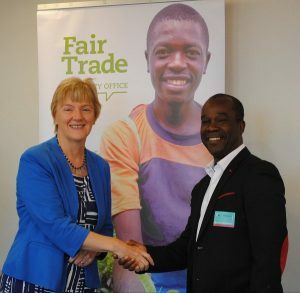 Yorkshire MEP, Linda McAvan who established the Fairtrade Group, explained that she is working to ensure that a strong Fairtrade Group continues once she, and other British MEPs, no longer have a seat in the Parliament. There are Fairtrade allies from across the EU, who can ensure that Fairtrade will be respected in the EU’s trading agreements. Linda McAvan also played host to Fairtrade producer, Fortin Bley. Fortin, a cocoa producer from Côte d’Ivoire, told the European Parliament Fairtrade Group how the money raised through his Fairtrade cooperative was used to build a school in his village, meaning that his daughters no longer have to walk 8km each way to get to school. In less than 6 years, participation in Fairtrade schemes across Côte d’Ivoire has gone from 9000 participants to an estimated 160,000 agricultural workers. Mr Bley switched to Fairtrade because it means a guaranteed price for his cocoa and a range of other benefits, including more control of the use of pesticides and working conditions in general. He also spoke about how women farmers were being given a voice through the scheme and access to maternity care and other rights. The new school was built using the Fairtrade premium which is paid into a community fund controlled by the members of the cooperative. This is why schemes like Fairtrade are so vital, they not only safeguard employment but provide a future for the entire community. Fortin Bley is the President of the CANN Cocoa Cooperative in Côte d’Ivoire and the Chair of the Fairtrade Western Africa Network. 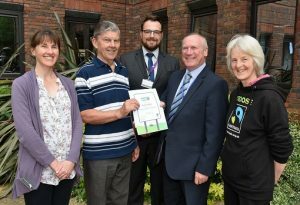 The East Riding has renewed its status as a Fairtrade county, helping to improve the lives of farmers and workers in the developing world. The Fairtrade status has been renewed until 2020 thanks to the work of the Fairtrade East Riding Network (FERN), an active voluntary group of which East Riding of Yorkshire Council is a member. FERN works across the East Riding to develop awareness of, and support for, Fairtrade. Issued by the Fairtrade Foundation, the renewal of this status recognises FERN’s ongoing efforts to promote Fairtrade to residents, businesses and schools within the local authority area. 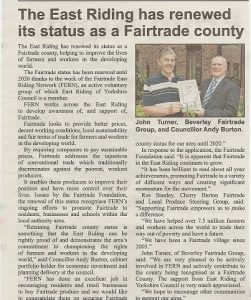 Councillor Andy Burton, cabinet portfolio holder for economic investment and planning delivery at the council, said: “Retaining Fairtrade county status is something that the East Riding can be rightly proud of and demonstrates the area’s commitment to championing the rights of farmers and workers in the developing world. Coverage in the ‘Beverley Life’ newspaper. Margaret Knapton of Hornsea Fairtrade Group said: “Hornsea has a great community spirit and their support of Fairtrade is simply an extension of that – making sure people, no matter where – are supported and rewarded for their hard work”. 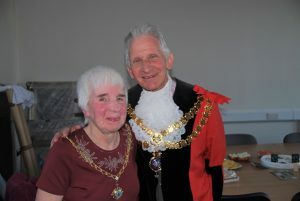 Fairtrade stalwart, Councillor Alan Hickman has been elected as the Mayor of Skipton. Alan has been a long serving member on the Skipton Fairtrade Initiative Group, which was responsible for Skipton gaining Fairtrade Town status in 2014. The ceremony was attended by local well-wishers, including Liz and Chantelle from Fairtrade Skipton and John Grogan MP was also in attendance. Embsay with Eastby is the most recent place in Yorkshire to gain Fairtrade status. 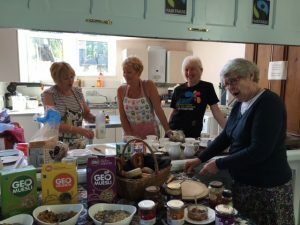 Local resident, Liz Roodhouse worked with the Parish Council and the church and community groups in the village to make Fairtrade Embsay with Eastby a reality. There is now a village Fairtrade Steering Group composed of enthusiastic local supporters. The village celebrated its Fairtrade status with a Fairtrade breakfast on 22nd May. 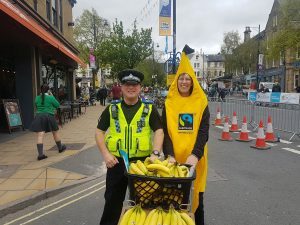 On the 4th May Fairtrade Ilkley supporters gave away Fairtrade bananas (Courtesy of the Coop and M&S) to cycling fans in the town. 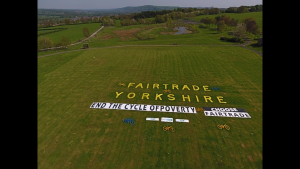 Watch more from Fairtrade Yorkshire on our videos page.